ROSCOE VILLAGE — Si Fu, a stir fry and taco bar that fuses Chinese and Mexican cuisine, is coming to a busy Roscoe Village strip, and for owner, Le Trinh, the location couldn't be better. "There are a lot of families here, a nice mixture of people and kids. But there are no good tacos or Chinese food on Roscoe Street, so we put the combination together," Trinh said. On Wednesday, dozens of DNAinfo Chicago readers are headed to a Si Fu "Taste of Chino Latino Kitchen" BYOB dinner that offers an all-you-can-eat taco and fried rice buffet along with dessert and complimentary Tarot card readings. Follow the evening's social media highlights using hashtag #DNAIRL here. Tickets to the private dinner — scheduled to take place before Si Fu Chino Latino Kitchen opens to the public — are $12 and can be bought here. A three-year resident of Roscoe Village, Trinh owns Banh Mi & Co. less than one block east of Si Fu Chino Latino Kitchen and also on Roscoe Street. Trinh owns Si Fu Chino Latino Kitchen with Marc Wuenschel, who also owns Hutch, an American bistro and brunch restaurant at 3301 N. Clark St. in Lakeview. 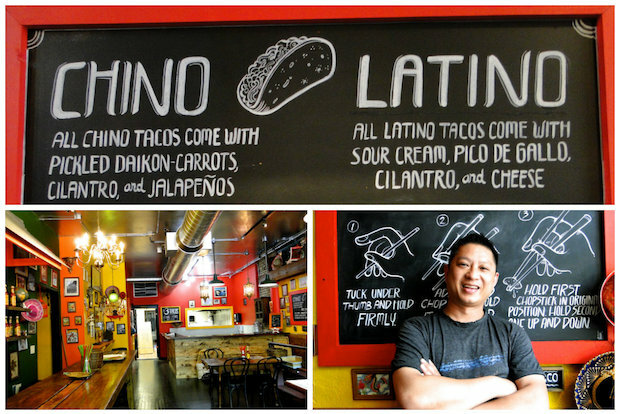 Si Fu Chino Latino Kitchen offers stir-fried rice and tacos. The eatery plans to open soon at 2116 W. Roscoe St. in Roscoe Village. The 41-year-old entrepreneur said Si Fu is, "a slang word used when walking into a kitchen and addressing the head chef." A fast casual style eatery that will offer counter ordering service, Si Fu will bring 10 to 12 jobs to the neighborhood when it opens at 2116 W. Roscoe St. within the next few weeks. Located next to Piazza Bella, the 1,800-square-foot eatery is packed with relics from China and Mexico, such as lanterns, sombreros and black and white photos from both countries. There is space for 32 diners inside, with additional room for 25 more people on back and front patios. Though Si Fu is currently BYOB, Trinh said he is in the process of obtaining a liquor license and hopes to offer margaritas, sake and Mexican and Chinese beers. Si Fu's straightforward menu offers seven varieties of tacos and stir-fried rice bowls, all of which can be prepared as "Chino" or "Latino" dishes. The choices are barbeque pork, Mongolian beef, teriyaki mushroom, coconut curry chicken, orange chicken, lemongrass tofu and lemongrass chicken. While the Chinese-inspired tacos are topped with pickled daikon radishes, carrots, cilantro and jalapeno, the Latino inspired tacos are topped with sour cream, pico de gallo, cilantro and cheese. Bowls of fried rice are $7.88 each and contain stir-fried rice and vegetables when prepared the Chinese way or rice and beans when prepared as a Mexican dish. Tacos are all $3 each. Si Fu Chino Latino Kitchen (website at www.sifukitchen.com and menu are both coming soon), 2116 W. Roscoe St. Ph: 773-290-0909. Hours are 10 a.m. - 12 a.m. daily. Delivery and catering will be available.